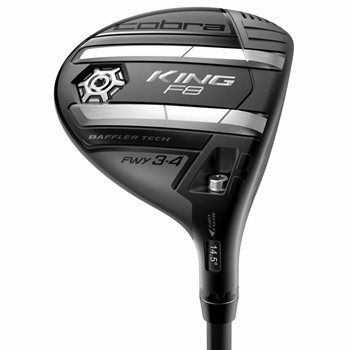 The Cobra King F8 fairway wood features an ultralight carbon fiber crown to promote higher trajectories and increased forgiveness as well as a forged E9 475 stainless steel face insert that maximizes flex for increased ball speeds and distance across all points of the face. The King F8 also features a progressive rail design for improved versatility and consistent contact from any lie while 360° Aero Technology optimizes aerodynamic performance and maintains a low CG for faster clubhead speeds. A fixed weight positioned low and back results in a high, towering ball flight that is extremely forgiving. MyFly 8 with Smart Rail Technology helps you to manage trajectory and fine tune launch conditions to maximize distance while keeping the face square. Cobra Connect Powered by Arccos, allows you to track their performance to improve your game. Progressive Baffler Rail design improves versatility and forgiveness, no matter the lie.